Medical service providers have a legal obligation to protect health information of patients. The Health Insurance Portability and Accountability Act of 1996 (HIPAA) requires health care providers to take steps to ensure that patients’ health information is secure. 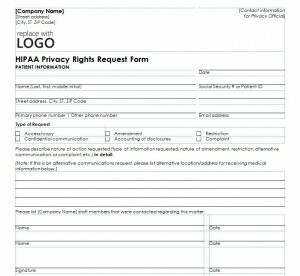 A HIPAA privacy form can help your organization start the process of and to maintain compliance with the HIPAA law. Download this template directly from this site. It is free and easy to use, and you can customize it to meet your organization’s needs. It is a clean, simple form that is easy for patients to fill out and for health care provider office personnel to read to quickly process health information requests. Fill in your organization’s contact information at the top of the HIPAA privacy form after you download it. Include the contact information of the person in charge of privacy. This makes the information easily accessible to patients should they need to get in touch with you. Replace the logo sample with your own. Add or delete any personal information that your organization needs to reach patients and administration information at the bottom of the form. Add types of requests that your office regularly processes to the “Type of Request” section if necessary. Delete those that are not applicable. Update the form regularly to ensure that you are in compliance with the HIPAA law. Save it to multiple locations so that you can access it if you are away from the office or if there is a technology disaster at the office. Ensure that your company’s name is inserted in all of the appropriate places in the form. Regularly check all HIPAA privacy forms you receive to be sure that each request was completely processed, and record any action taken on the bottom of each one. Distribute the form electronically so that patients can quickly access their personal health records. This can also speed up the time it takes your office to process requests. The HIPAA privacy form provides patients with the opportunity to access their medical information and any amendments that have been made to it. It also increases your office’s efficiency. This template provides your office with a tool to increase its request processing efficiency and ensure its compliance with the HIPAA health information privacy law.